Over the last 18 months Teach First has been working with Victory Television, part of the Sony group, on a documentary series following a group of Teach First teachers as they work and train in schools in low income communities. 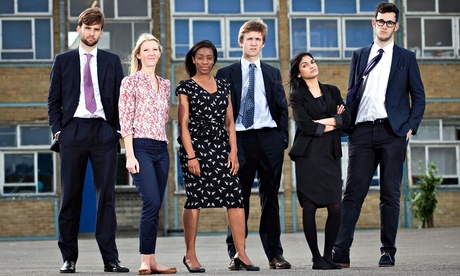 The result was Tough Young Teachers which aired on BBC Three earlier this year. I could probably write a book on the experience, but we’re all busy people, so here are some things I thought would be useful to share with you. …I knew they weren’t right for us. With Victory, we felt like they understood what we were trying to achieve by opening up our work to the cameras. They wanted to make a positive programme about young people doing something to help other young people. Why did we want to get involved? A key part of our work is to raise awareness of the issue of educational inequality. For example: did you know children eligible for free school meals are only half as likely as others to get the basic five good GCSEs? We saw the documentary as a way of shining a light on this. We also wanted to show what a challenging, rewarding job teaching is. There are many who still see it as a cushy career choice, which is far from the reality. Lastly, there is a big crossover between the BBC Three viewership and one of our core audiences – students and recent graduates. On campuses we compete with big businesses for recruits, and while we can’t match them in terms of spending, we offer a unique opportunity to make a difference. A primetime BBC Three slot would help increase awareness of this. How did we manage risk and make the most of the opportunities? The prospect of high levels of media and public interest made us scrutinise our messaging, identifying potential criticisms and preparing a ‘myth-buster’ to equip people throughout the charity with responses. The documentary was never going to show the full story, so we set about collating a range of content – blogs, videos and interviews – to provide context and combat criticisms and misconceptions. Every Thursday night, when an episode aired for the first time, a team from our comms department set up camp in our London office to share this content and to monitor and engage with social media. On the final night we held an after-show event, ‘See me after class’. Written and hosted by members of the comms team, it was streamed live on our website – a first for us – and involved interviews with the documentary participants, with questions gathered via Facebook and Twitter. To engage the mainstream media, we worked with Sony on a media screening, which attracted a good turnout (despite clashing with the press launch for The Voice!). We were able to set up opportunities for exclusive interviews and school visits, which meant we received coverage in nearly every mainstream newspaper. Although securing broadcast coverage was more challenging, we managed to get a couple of the teachers on the BBC Breakfast sofa and one of them, Chloe, did a number of back to back interviews for broadcast on local BBC radio stations. Around two million viewers tuned in live to the first episode (across three broadcasts) and many more watched via BBC iPlayer. Our website saw a 177% increase in unique visitors compared to the same period last year; 69% were new to the site. We attracted 2,646 new Twitter followers (compared to 322 in the same period last year) and Twitter became the third highest traffic referrer to our website. We attracted 1,600 new Facebook fans (compared to 442 in the same period last year). Almost 4,000 people have watched ‘See me after class’. We secured 475 media mentions, of which 93% were positive or neutral and 86% referenced our cause, a key KPI for us. In addition we had a spike in the number of people opening application forms for our programme after each episode. The series allowed us to reach new audiences and was, overall, positively received. It sparked interest in our work, challenged stereotypes of the schools and pupils we work with and opened eyes to the difficulties pupils face. It also seemed to shift people’s opinions about what it is to be a teacher. Inevitably, though, it reinforced some people’s existing criticisms. Within the comms department, it gave us an opportunity to take a creative approach, and pushed us towards greater rigour in our planning, in developing our messaging and in our risk assessment.